Not too much time dedicated to painting anything this week, but I did manage to get the vehicles from the Bobbybox done. These were all from Warpath, and included an old school Orx Raptor trike and three new-school (is that even an expression?) Veermyn Tunnel Runner monowheel-things. While I was at it, I decided to include another Raptor that I had lying about and paint that up as well. The Orx Raptor is one of the earliest, if not the earliest restic vehicle kit Mantic made. Stylistically it is obviously made as a substitute Space Orks buggy, and as such is actually a quite nice representation of a crude, ramshackle speedy light vehicle weapons platform. Like all Space Ork vehicles, reality gets left at the door. I mean, putting the radiator and air intake for the engine directly behind the front wheel of the trike, without any mudguard, would probably lead to the engine failing catastrophically due to clogged intakes in short order. The little front windscreen the driver is supposed to see out of, is completely blocked by the massive engine. Probably why it is called an engine block. The gunner has no seat, handholds, rails, straps, or anything to hold on to apart from the rocket launcher itself, so that makes it really easy to aim when bumping around in a speedy buggy…speaking of the rocket launcher, it points by default directly into the front wheel by way of the engine…but this kind of élan is what makes an ork vehicle orky, isn’t it? Anyway, the kit itself is rather crude, with large parts that did not fit together at all. Every major restic part was warped to some degree. Getting the parts to fit needed a bit of boiling water to soften the restic and some bending into shape before dunking in ice cold water to set the new shape. I recommend to do parts that need to fit together at the same time, and hold them together in the correct position when dunking in the cold water to set them. In the end, the kit cleaned up well. The Veermyn Tunnel Runners are rather newer kits, from the recent (well, it might be as much as two or even three years since) Warpath kickstarter. 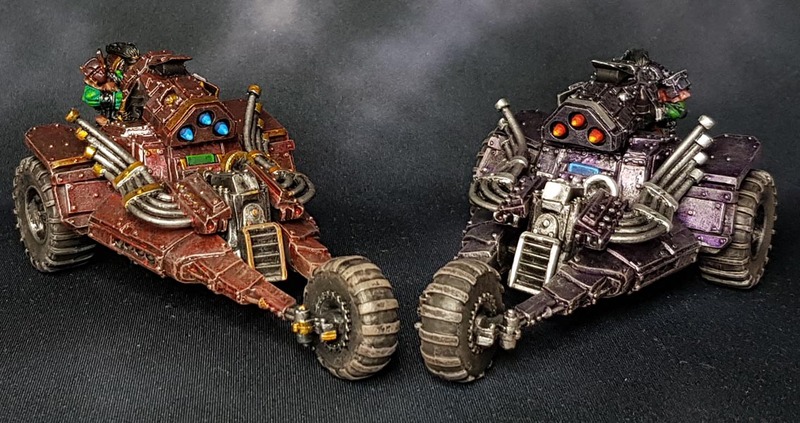 The space skaven equivalent of bikes. They are made in a newer pvc plastic and not restic as such. Still, two of the three I got needed to be put in hot water to straighen out warpage and make the parts fit. When immerded in hot water, they warped back into their correct shape by themselves. The kit itself is very intuitive and easy to put together, the main body of the thing being a one piece casting, with only smaller parts like the arms, head, guns and outside blades needing to be glued on. Very nice details, much sharper than on the Raptor. I would wager a pretty penny that the Raptors were originally designed the old fashioned way by the designer making a physical model that was used to make moulds from, while the tunnel runners are obvious digital designs. I painted them by undercoating black, and drybrushing a series of different metallics before dotting in details. The Raptors also got coloured ink washes to add some colour to their main bodies. This is a very quick way to do such vehicles and I did not want to spend too much time on these so I kept the weathering to a simple drybrush with earth brown. Which is more effective than it sounds, really.